The Yonge Street area south of Bloor is undergoing an exciting rejuvenation, and FIVE – Condos at 5 St. Joseph is leading the way with architecture that marries innovation and restoration. Highly successful FIVE is the first condominium by Five St. Joseph Developments Ltd., which was formed by Graywood Developments Ltd. and MOD Developments Inc. They enlisted Hariri Pontarini Architects to create a design for the 48-storey modern tower that will carry residents into the future in style while incorporating components of the existing heritage architecture - all without compromising the old or the new. Construction is slated to begin this coming Spring on FIVE, which will become a landmark in this strategic hub of many of Toronto’s most exciting amenities. 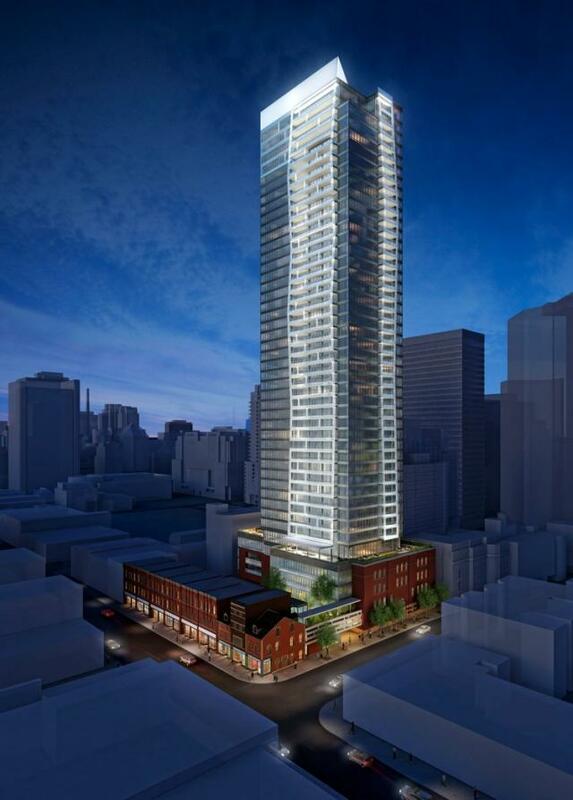 With the understanding that design excellence is an integral component of the revitalization of this area, FIVE’s iconic design includes the restoration of nearly half a block of historically significant buildings on Yonge between Wellesley and St. Joseph. The historical preservation involves the restoration of the Yonge Street frontage, which will include new windows, roofs, storefronts and the cleaning of the original façades. The retention of the four-storey 1905 Gothic revival façade of 5 St. Joseph will be the largest façade retention ever undertaken in Toronto. The fronts of 25 and 17 St. Nicholas (six storeys) and 15 St. Nicholas (three storeys) will be documented and new façades will be built to match the architectural spirit of the originals. ERA Architects is handling the historic restoration aspects, including the tower’s podium, which will be topped by a roof garden designed by Janet Rosenberg and Associates. The edgy, sophisticated interiors by Cecconi Simone Inc. include the 10,000 square-foot FIVE ON FIVE with its piano bar/dining room; billiards; cocktail lounge with bar and kitchen; TV lounge and party room; men’s and women’s spa-like change/club rooms with wet and dry steams, “experience” showers and private lounges; cardio and weight training studios; and a spectacular 6,000 sq. ft. outdoor roof garden. Topping off the conveniences will be 24-hour concierge service and a Club Director. Luxurious suites feature kitchens with Cecconi Simone custom-designed cabinetry and multi-level island, granite or Corian countertops, and a Miele appliance package; hardwood flooring; Cecconi Simone-designed bathroom cabinetry; and incredible views. Choices range from heritage lofts to tower suites, with studios, one-bedroom, one-bedroom + den, two-bedroom and two-bedroom + den layouts, in sizes from 400 to 1,400 sq. ft. Prices start from the mid-$200s. MOD is led by industry veteran Gary Switzer, the former head of high-rise development at Great Gulf Homes who spearheaded several award-winning landmark condominiums in the city, and Graywood is the renowned developer of The Ritz‑Carlton, Toronto. Call 416-928-0555 or visit www.fivecondos.com.